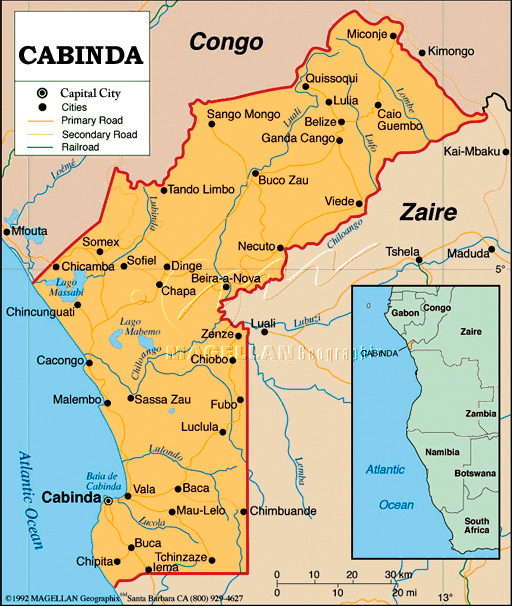 Cabinda, a province of the country of ANGOLA, is separated from Angola by a narrow strip of land belonging to the CONGO (KINSHASA). Though small in size (about 2,800 sq. miles), Cabinda has figured prominently in the economics and politics of the region for many years—particularly because of its valuable oil fields. Europeans visited the region in the 1500s to trade for copper, ivory, and slaves. When European powers carved Africa up into colonial empires, the Portuguese gained control of Cabinda. To keep a close watch on separatist groups within the local population, Portugal made the port city of Cabinda a district capital of northern Angola. Portuguese companies exported the riches of Cabinda, including timber, cocoa, palm products, and other resources. In the 1960s oil was discovered offshore, making Cabinda one of Angola’s key resources. When Angola won independence in 1975, a civil war began between the Popular Movement for the Liberation of Angola (MPLA) and the National Union for the Total Independence of Angola (UNITA). Both groups hoped to control Angola eventually, and neither wanted to lose the valuable Cabinda. While the rest of Angola’s economy suffered during the war, government forces protected Cabinda’s oil operations and oil production continued. At the same time, the Front for the Liberation of the Enclave of Cabinda (FLEC), formed in the 1960s, waged a guerrilla war for Cabindan independence. It sometimes fought from bases in neighboring countries. Both the MPLA and the UNITA attacked FLEC at one time or another. In the mid-1990s, the MPLA and the UNITA officially ended their conflict, but FLEC continues its battle. Although many Cabindans support independence, FLEC is too divided by internal rivalries to accomplish this goal. However, it seems likely that a majority of the population would vote for some type of independence if a free vote was held. It is also hard to determine the size of the Cabinda population due to the area’s instability in the late twentieth century and the coming and going of refugees. It has been variously estimated at 100,000 and 200,000.